Calming grays with bursts of yellow add cheerfulness, especially when a room is flooded with natural light. Fabric adds luxurious finishing touches to your home. The fabric you choose, from window treatments to the upholstery on your sofa, sets the tone of your home. It can take center stage quietly, so don’t have it be an after thought, instead work it right into your design. Fabrics bring the project to life. Every project has that bit of “wow” that makes it stunning and memorable. Many times, these looks come from the accents and the fabrics. One bedroom in Vail was done in greens, black and white — it was very dramatic and stands out in my mind as one of my favorite projects. 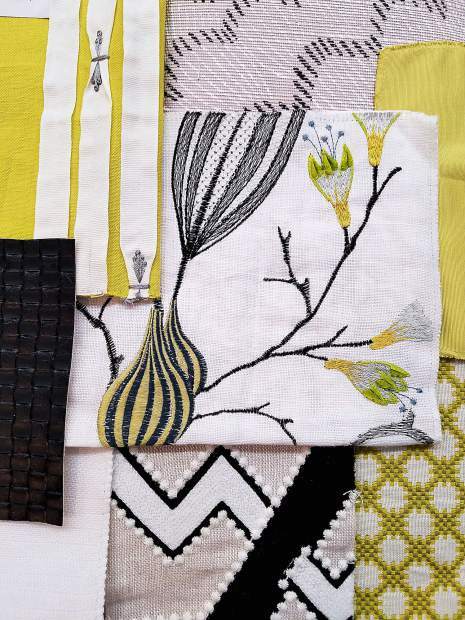 Another home had neutral, calming grays with bursts of yellow, which added cheerfulness. I love the look and feel, especially when the room is flooded with natural light. Upholstery needs to fit your needs. In other words, the family-room sofa should be done in quality, durable fabric, and stain resistance certainly doesn’t hurt. For the more formal living room, you have a little more freedom in the type of fabric. There isn’t one secret formula as to what fabrics work best together, but I do like to make sure a room carries a variety of textures. For example, I will have a very durable fabric on the sofa but will add in silk or velvet pillows for softness. I like to create a color family and then add a totally unexpected fabric and color to make sure there is still visual interest. You can also use the cool color family and the warm color family beautifully together. Work a lighter-weight fabric into your home design with window treatments. I think linens, cottons and mixed fabrics work best for windows. The weight of the fabric dictates where it fits best. Still second-guessing yourself? The manufacturer states the best usage on the fabric. Also, in general, I prefer natural fabrics, such as linen, cotton, silk; but if using synthetic, I use a mix of natural and synthetic for a strong look. Use fabric in a bold, unexpected way. One project stands out in my mind, when we used fabric on the front of a console piece. It was unexpected and really brought the room to life. Using bold fabrics feels nerve-racking, but it doesn’t have to. Sometimes it’s fun to incorporate a daring use of fabric; I am thinking of a bold pattern that really speaks to you. If you love it, I say go for it. Oftentimes, these colorful, exciting fabrics are very expensive, making it a case for quality over quantity. There is a resurgence is hand-drawn, carefully woven fabrics. They are positively high quality and swoon-worthy, and they can be decadent and stately or bring a touch of whimsy into a room. One thing is for sure: Bold fabric creates the “wow” moment we all love. Try something new. Fresh window treatments, new throw pillows or re-upholstered dining room chairs add a boost to your home without having to re-do the entire space. Insider tip? Jade green is an amazing choice — it works so well in our mountain environment, and the color warms the space. Yvonne Jacobs is a principal designer at Slifer Designs. She loves to work color, texture and fabric into home designs.